A mojito is a kind of cocktail. It is from Cuba originally. It is made of rum, sugar, lime juice, sparkling water and mint. It usually contains about 10 percent alcohol. The combination of sweetness, sour citrus and mint flavour is intended to complement the rum. It is popular drink in hot weather. When making a mojito, lime juice is added to sugar and mint leaves. The mixture is then gently mashed together. The mint leaves should only be bruised to release the essential oils; they should not be torn apart. Then rum is added. The mixture is then stirred to dissolve the sugar. Finally, ice cubes and sparkling water are added in the top of the drink. 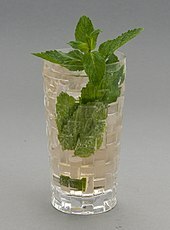 Mint leaves and lime wedges are used to garnish the glass. There are several stories about how the mojito was invented. One story says that it is similar to a 19th-century drink called "El Draque", after Francis Drake. This drink is said to have been given to the crew of Drake's ships when they came to Cuba in the 16th century. Many in the crew were suffering from dysentery and scurvy. They were told that the Native Americans had remedies for various tropical illnesses. They went ashore on Cuba and were given ingredients for a remedy: a kind of rum, lime, sugarcane syrup and mint. While this drink was not called a mojito at this time, it is the same combination of these ingredients. Wikimedia Commons has media related to Mojito. ↑ "Traditional Mojito recipe from Cuba". Taste of Cuba. Retrieved 1 September 2011. ↑ Colleen Graham (11 June 2011). "Mojito". About.com. Retrieved 1 September 2011. ↑ "Summer Cocktail News: Mojitos Go Fruity". Prweb.com. 4 June 2008. Retrieved 1 September 2011. ↑ 4.0 4.1 4.2 "Shake It Up, Baby: Cuban Cocktail Is Making a Splash". LA Times. 12 August 2001. Retrieved 1 September 2011. ↑ Posted by Fumi. "How to Muddle a Mojito". WasabiBratwurst.com. Retrieved 1 September 2011. ↑ "The Classic Cuban Mojito". Artofdrink.com. Retrieved 1 September 2011. ↑ Burkhart, Jeff (2012). Twenty Years Behind Bars: the spirited adventures of a real bartender (1st ed.). PhotoCine Media. ISBN 9780985500115. This page was last changed on 3 January 2019, at 02:17.